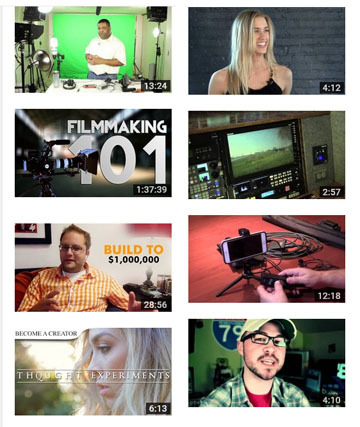 After the video itself, the video thumbnail may be the most important element of a video. Combine this with a video title that is what the viewer is looking for, and you have helped your video win a lot more viewers. The thumbnail-title combination is a powerful click motivator. So it’s smart to create a very deliberate thumbnail rather than blindly let an algorithm choose a random one for you. Previously, YouTube did not allow this option. But now if your YouTube channel is verified, you can upload a custom thumbnail. Getting verified on YouTube is easy and provides lots of benefits. YouTube wants you to verify your account because it doesn’t want bots uploading videos. Here’s a short video that explains how to get verified. Notice his custom thumbnails. 1. Use close ups of faces, especially those making eye contact. Faces are compelling, but if the topic of the video is a product or other physical item, use that. 2. Strong emotions are more compelling. Show a face with a strong emotion. 3. Show the face in front of a bright colorful background. A high contract between the face and the background is best. Some people even make a graphic outline around the face to make it stand out more. 4. Text can work, but keep it to three or four words which do not hide the face. Again keep it contrasty so it is readable. 5. A bug or logo superimposed on the left bottom works. But keep the lower right free as YouTube often uses this area for one of their graphics. 6. Give the thumbnail an identifiable design or look any time there are a number of videos from the same producer. This reinforces the brand. 7. Design for the small screen of smart phones. 8. Keep the thumbnail simple and easy to understand. 9. Don’t mislead. A YouTube thumbnail of a bare-breasted woman not only misleads the viewer, but is also penalized as misleading. Work on your thumbnail in a program like PhotoShop. Check that it works just as well as a small graphic. To find examples of good thumbnails, just Google – most popular YouTube videos. I have just been renewing all the thumbnails for the video material on our website. We will be releasing an updated website very soon. Thank you for the helpful tips. They are very useful.